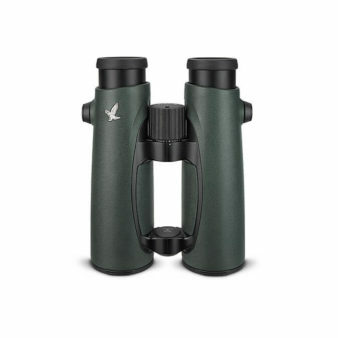 The Swarovski 8.5×42 EL Swarovision binocular offers a large, bright field of view with unparalleled clarity right to the edge of the image. Astounding, superb, unparalleled quality – superlatives that describe the Swarovski 8.5×42 EL42 Swarovision Binocular with FieldPro Package. This binocular was newly retooled in 2015. It brings cutting edge optical performance to a new level. While the original EL series set the benchmark for clarity, color accuracy, and handling comfort, the EL Swarovision binoculars raise the performance bar even higher. The optical system has been enhanced in all of Swarovski’s HD optics with legendary performance-enhancing multilayer lens coatings. The optical path is enhanced even further with the addition of field flattener lenses. These field flatteners ensure an edge-to-edge sharpness and clarity that’s free of distortion and other distractions. The EL SV’s construction also has been improved. An open-bridge design provides viewers with long-term viewing comfort, enhanced stability, and ease of handling. The housing is covered with a rubberized finish that offers a secure tactile grip and a bit of shock resistance. Stellar all-climate performance is ensured via nitrogen purging. The rugged magnesium housing is sealed and purged to create a watertight and fogproof internal system – one that’s impervious to dynamic climates and difficult conditions. The focusing system has been upgraded as well – this optic focuses down to 4.9′ and the viewer can go from infinity to minimum focus with two full rotations of the center-focus dial. A wide angle field of view and truly noteworthy eye relief contribute to this fine sporting optic’s viewing performance. Even when wearing glasses, the view remains unobstructed, free from vignetting, and lush with crisp detail. These come with a comfortable neck strap, a case good for travel, a rainguard and objective lens covers. Audubon Shop flexible harness is available. Wide angle field of view. Larger ocular lenses provide enhanced resolution. Field flattener lenses deliver a razor-sharp distortion-free view. HD optics: fluoride glass elements with Swarovski’s proprietary coatings yield superior edge-sharpness, digiscoping imagery, excellent twilight performance. SWAROTOP anti-reflective multicoating: enhances light transmission. SWARODUR coating: enhances scratch resistance. SWAROBRIGHT mirrored prism coating: improves brightness and color reproduction under all lighting conditions. Extended eye relief accommodates eye and sunglass wearers. Nitrogen purged: waterproof, fog proof, submersible. Open-bridge EL design affords a comfortable wrap-around grip. Tactile rubber armoring for shock and all-climate weather resistance and enhances user’s grip. Improved objective cover design offers an enhanced level of protection. Twist-up eye cups with 3 detented settings.